Welcome to the ninth edition of MAMA Boards, an AppsFlyer video project featuring leading mobile marketing experts on camera. For today’s mini whiteboard master class, we have David Llewellyn, Senior Marketing Director at Debut, the world’s first careers app dedicated to students and graduates. He brings with him a wealth of knowledge and experience working for top companies like mytaxi, skyscanner, Shazam and Amazon. Organic growth is the holy grail for most app founders and investors, but many don’t realize that this is the exception, not the norm. David walks us through debunking this myth and presents a more realistic picture of what marketers and investors alike can expect from their organic traffic, later offering 3 action items for maximizing this traffic and scaling your app for less. Hi and welcome to another edition of MAMA Boards by AppsFlyer. My name is David Llewellyn and I’m the Marketing Director at Debut. Debut is a recruitment app for graduates that connects employers with amazing early talent. My background is in Full Mix Marketing and Business Development, predominantly for mobile-first marketplace businesses such as Skyscanner, Amazon, Shazam, and then most recently Halo and mytaxi. 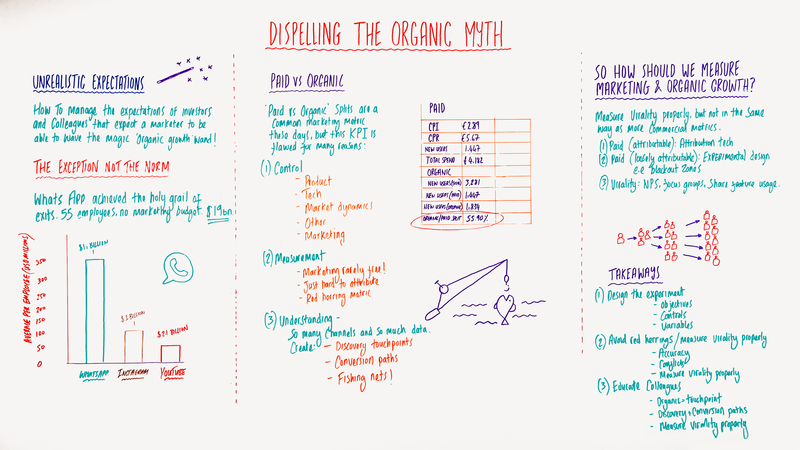 Today, I’m going to be talking to you about “Dispelling The Organic Myth,” talking a little bit about how marketers can manage the expectations of their investors, colleagues, and other shareholders when it comes to growing organically and what that means. Let’s get started. Organic growth is the holy grail for most investors and founders. However, as I’m just about to explain, it’s very much the exception and not the norm. So, what does that even mean? You can call it organic, you can call it viral, you can call it word of mouth; effectively, what we’re saying is free, peer-to-peer, and media recommendation for your product. When we look at some of the biggest tech success stories and the biggest exits, what we see is that organic growth has been a common underlying trend. With the likes of WhatsApp, Instagram, and YouTube, a lot of their early growth was driven by this free, word-of-mouth marketing. WhatsApp is obviously the best example of this. It achieved an exit of $19 billion with just 55 employees and, supposedly, a marketing budget of zero dollars. When you break that down into the value generated per employee, that’s $345 million per employee, which is absolutely remarkable. 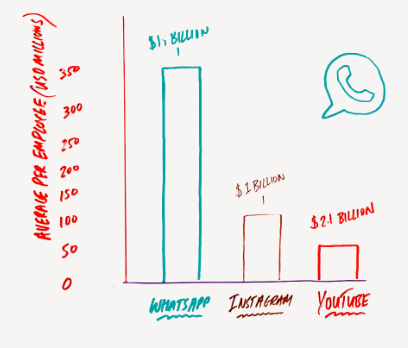 However, when we look at other big success stories of the likes, the likes of Instagram and YouTube, we see that they’re far, far smaller in comparison to WhatsApp. So even amongst its peers, it’s one of the largest tech exits. It’s very much the exception, not the norm. What we can learn from this is that these kinds of success stories where a business grows for free organically by word of mouth are incredibly rare. The unfortunate problem is that the media creates a lot of hype around these and sets the expectations, and that can cause a lot of problems for marketers. You may have founders, investors, shareholders, and colleagues who expect them to wave a magic wand and create this kind of growth. That’s simply not realistic. What we’re going to look at today is how we manage those expectations and their potential impact on budgets, or on the KPIs that your business works towards, and on how you as a marketer assist within your role. Let’s take a look at how a marketer can actually influence some sort of control over organic vs. paid splits. The first thing we need to look at is how most businesses measure that. A lot of businesses will simply measure organic vs. paid splits in their business or organic vs. paid ratios. And effectively, what they mean by this is that they categorize 1) the paid as all performance marketing channels and the things that we can attribute really easily and then 2) the “organic” as everything else, as if everything else doesn’t carry any sort of cost. There is a huge flaw in measuring it this way. There is also a huge flaw in expecting a marketer to have that as their pure-play marketing KPI to measure organic growth. What we’re talking about when we’re talking about organic growth is your potential customers and your current customers engaging and discussing your product. Your customers are (hopefully) telling these other potential customers how great that product is and compelling them to take some form of action and engagement with your brand, and later to transact with you. That’s what organic growth is. Now, there is a huge problem here in terms of how a marketer can actually influence that. The reason being that when they’re talking to their friend about your product, they’re talking about exactly that: the product and the proposition, its relevancy and its quality. They’re talking about tech that underlays it, how stable is it, how well it performs. They’re talking about other market dynamics, such as your competitor’s service – they might be comparing you to that. And they’re talking about various other things that are largely out of your control. Now, of course, they may also talk about the marketing of your product. But when was the last time you bought a product based on the fact that they had a fabulous marketing campaign, but didn’t like the product? You may trial that product once, but you’re certainly not going to become a repeat user. Therefore, marketing can only control so much of organic growth as a whole. If you measure it by simply bucketing all of your performance activity in one bucket and then everything else into the organic bucket, then you’re not even measuring organic growth anyway. Let’s take a look now at how businesses measure organic growth. As I said, many businesses look at organic vs. paid splits, otherwise known as organic vs. paid ratios. What this actually means in practice is performance marketing versus everything else. Now, that’s obviously far too simplistic and, yet, it’s one of the main KPIs I’ve seen that a number of businesses look at when they’re trying to understand organic growth. It suggests that things like above-the-line advertising and PR are completely free and even if we’re talking about stuff that doesn’t cost us anything externally, things like blogging and SEO, for example, that we can do in-house, they still carry a cost. It’s just a human resource cost rather than a third-party cost. At very, very best, this metric could act as an early indicator that a particular new product feature has gained some traction in the market, but to my previous point around control, that would be a product thing anyway – that wouldn’t really have been driven by marketing. But really, at worst, this is just a complete red herring. The paid being all things performance versus organic being everything else bundled together, that’s clearly false economics. We must work a lot harder to find attribution models that give us a good understanding of ROI for non-performance marketing channels and also for our internal HR costs. Lastly and most importantly, I want to talk about how businesses understand organic in general. We live in a world where there is simply so much data and so many channels which marketers can now use to target their perspective clients. To illustrate my point, I would argue this is similar to the way a fisherman operates. Imagine that your performance marketing channels, which you can use to target, find, remind, and discover your potential clients, are the fishing net. Further, this thing that we call organic, which isn’t really organic but everything else that you throw out there like PR and radio advertising and print advertising and whatever else it might be, this big bundle here, that’s the bait. Your performance marketing channel is acting as a net. Now, we can simply throw the bait into the water and hope that attracts people, but unless we’re giving them really, really nice places to discover our brand and then a really simple conversion path, through, for example, a Facebook campaign to the App Store and then onto being a customer, then we’re not really making it easy for ourselves. In fact, we’re essentially shooting ourselves in the foot by simply throwing out all of this above-the-line marketing, hoping people feel compelled to go to the App Store, and then just magically coming to find and download our app of their own accord. Why would we not when we live in a world, which has so much data to target these users with and then fantastic technology like AppsFlyer to actually attribute and report on the ROI of that activity? Why would we not create this fishing net to support all the bait that we’re throwing into the water? So for me, the most important thing around organic growth is many, many users that you attract may well have had word-of-mouth marketing from their friends and from their peers and from the media. They may well have, a long time ago, felt compelled to download and engage with your service. But that doesn’t mean that they run off straight away and do so. Instead, we’ve got to go and find them and we’ve got to give them as many easy discovery touchpoints and simple conversion paths to make their life easier to become a customer with us. 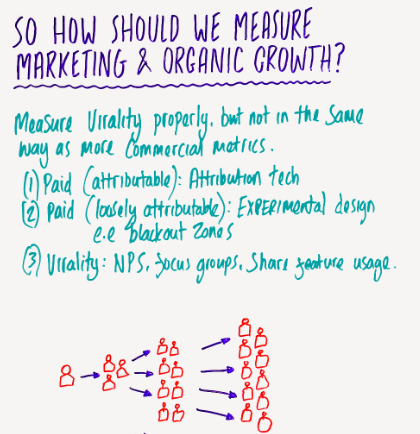 How should we be measuring organic growth? 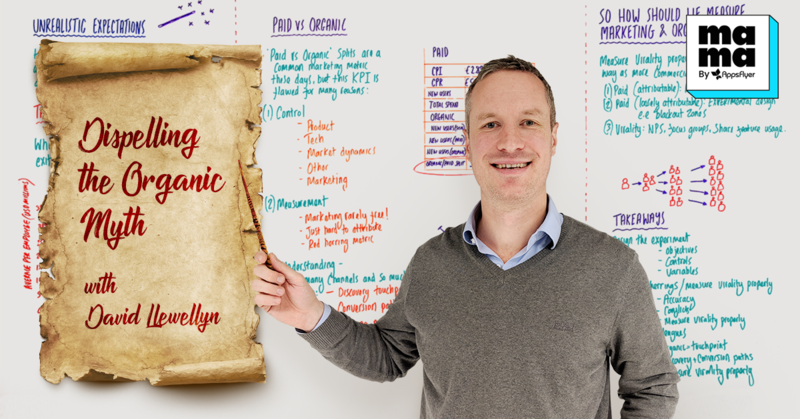 So, if we agree that organic vs. paid splits is, at best, a very simplistic and slightly lazy way to measure organic growth, and, at worst, a red herring that can actually damage what you’re trying to do as a marketer, how should we be measuring organic growth in our business? I would follow this model. It’s quite a simple model which needs adapting for the nuances of your industry, specific business, and its objectives. The model itself is relatively straight forward but the execution is, of course, not. The model is as follows. When we’ve got amazing technology like AppsFlyer for our performance marketing channels, let’s use that, let’s make the most of it. We can be as granular as we like when it comes to creating these fishing nets, a performance marketing strategy to help the user discover and then convert to being a customer. Secondly – and this is the bit that most companies just bundle into bulk “organic” – we need to actually work a lot harder to try and attribute the activity that we take for above the line advertising, PR and all of the other examples of things that are hard to attribute. They might not necessarily work with a direct attribution technology, but nonetheless are things that cost us money and that we believe drive growth. Otherwise, we wouldn’t do them. There are some new technologies that can help you attribute these trickier elements. For example, AppsFlyer has a TV attribution product. Where we don’t have that kind of new attribution tech in these channels, we need to operate really robust experimental design. I’ll talk a little bit more about what I mean by that in a moment, but effectively, there are lots of ways of getting data on the efficiency of whatever activity it is that you’re doing. A good example of that would be blackout zones. So, if you’re running a national radio campaign, you’d want to carve out two or three large regions that you believe are homogenous and not advertising those regions. That’s a good way of seeing what the incremental uplift is in the regions in which you do advertise. But the point being here with these paid channels, we need to work very, very hard to find attribution models. I appreciate that’s not easy, but if we don’t do that, then we’re not doing our jobs. Lastly, when it comes to measuring organic growth, I think I would decouple it completely from a lot of the commercial metrics that we’re seeing be in our performance marketing channels or be in our above-the-line and other less attributable channels. Decouple it completely if you want insights into whether your customers are recommending your product to other people, which is surely one of the most important bits of insight you can gain in a business. Simply looking at your paid vs. organic splits is not going to help you achieve that, it’s very lazy and very damaging. Instead, if it’s that important, which I definitely believe it is, let’s specifically carve it out and measure it in a completely different way. Let’s commercially focus, let’s actually just use quant and qual research techniques. Let’s ask people what they think of our product, let’s use things like NPS to look at their propensity to recommend it to a friend. Let’s use focus groups to gain deeper insights into why they would recommend it and why they wouldn’t recommend it and what your competitors’ advantages are and so on and so forth. If virality and organic growth are important, let’s do it properly and let’s invest time and money to really look into it. There are some simpler ways of looking at viral growth and those would only be if you have a share feature within your app, which most apps do. We look at the uptake of that over time, but the key thing to bear in mind is that it should be non-incentivized. If you’re incentivizing users to share your app, that’s not organic growth. Therefore, if virality is that important, let’s carve it out, let’s do research, let’s do quant and qual and let’s really gain some deep insight into what people think about our product. As I say, let’s use some simple reporting that we can get within the app to look at whether people are even just sharing it with their friends on social and so on. That’s how we will hopefully create a viral network effect, by understanding on a much deeper level than simply looking at paid vs. organic splits. So, takeaways for today. First things first, we need to really help the business understand what the ROI is for non-performance marketing channels and as I said, that’s not an easy job. We, therefore, need very, very clear objectives of what are we trying to achieve with a campaign and what strategic drive we are feeding into with the activity that we’re undertaking. Then, we need to set controls and isolate variables. So those are the blackout zones that I was talking about earlier when we’re doing things like radio advertising and TV advertising. Try to ensure that you have fewer, rather than more, variables feeding into the data that you’re going to examine at the end of this and also try to set some control groups wherever possible. By doing that, we help the business, and ourselves, understand a lot better what the ROI is for non-performance marketing channels. As I’ve said many times, we’ve already got performance marketing covered with the attribution technology that we’re using. 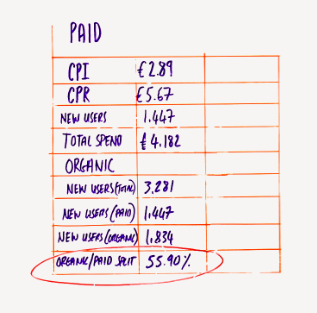 Once we’ve done that bit and we, both as marketers and our business, understand what the ROI is of the non-performance marketing channels is that we’re using, we need to then make sure that we’re measuring it properly. So we need to really avoid red herring metrics like organic vs. paid splits. We need to make sure that what we’re measuring, along with the KPIs that we’re setting ourselves and the way we’re measuring them, is highly accurate. We need to make sure that it doesn’t conflict with other KPIs in the business. So what is the knock-on effect of optimizing towards one KPI? Does it impact another KPI with the law of unintended consequences? We need to be very careful that we’re accurate with what we’re measuring and that what we’re measuring doesn’t also deter from another part of the business. And then, let’s just carve out the virality piece and measure it properly. So, we’ve proven that we have a better understanding of non-performance marketing channels. We’ve done that by having very good experimental design where we avoid the red herrings and we make sure that what we’re measuring is accurate. But then, let’s just take virality aside and measure it properly with other techniques. I would argue that using a partner to do that, a completely independent partner who specializes in research, is a really good thing to do. Finally, once we’ve understood a lot more about our non-performance marketing channels as a business and a lot more about our virality and our organic growth and what people think about our brand and our proposition, then we need to make our lives easier and educate our colleagues. They need to understand that organic is probably one of many touchpoints that a consumer will experience when they come to engage with your brand. Again, if we just rely on those organic touchpoints, and for them to then disappear off to the App Store of their own accord and download our app, then we’re fooling ourselves. Simply won’t happen often enough. With all the amazing technology we’ve got and with all the benefit of being much better at attribution as we now are, we can create these amazing discovery and conversion paths using performance marketing to ensure that when we do throw the bait out into the sea, that the customers come along and we can catch them and we can find them really easily. 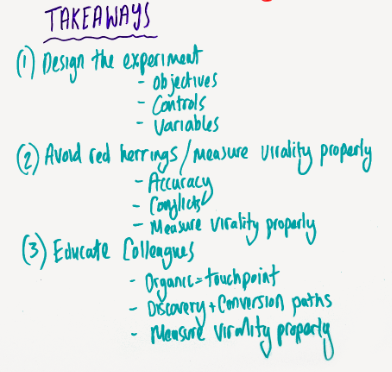 By doing all of that, we get to the final point which I just want to reiterate which is if you’re going to look at organic in your business, do so by measuring it properly. Don’t try and use simplistic red herrings like organic vs. paid splits and don’t tie it too closely to your commercial KPIs because it simply won’t work. Measure it properly, probably with a third party partner, and get proper deep insights so you can understand whether you are likely to be the next WhatsApp owner. So that’s all for me, thanks very much for watching. If you have any questions or comments, just pop them in the question box below and if you want to watch other MAMA Boards, then just click this link below, but that’s all for me, so thanks very much!